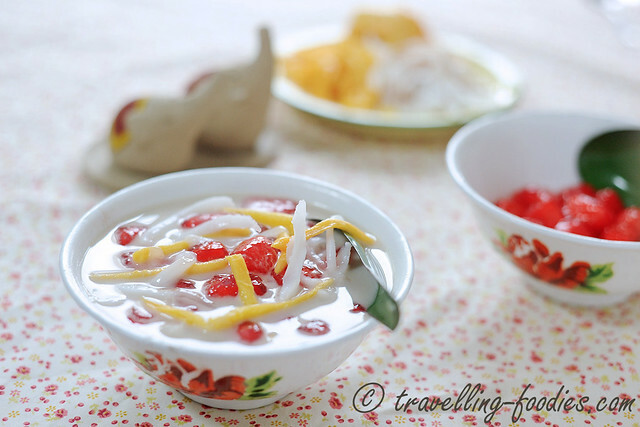 Tub Tim Grob is easily the most popular Thai dessert out there. Probably second if not on par with Mango and Glutinous Rice aka Mango Sticky Rice. Well, I prefer the former, especially when one is on the hunt for good Thai street food, simply because it really helps to bring down the heat one experiences along the streets of Bangkok and also, it is much lighter than Mango Sticky Rice which helps a lot in enabling me to go for other yummy Thai snacks along the way! That said, I refrain from eating Tub Tim Grob offered by the street hawkers, not because the standards of the food has dropped, but simply because the standards of hygenie hasn’t risen much over the years. Thankfully, this dessert is so easy to re-create within the comforts of one’s home kitchen! The ingredients are just down to a small handful for Tub Tim Grob. 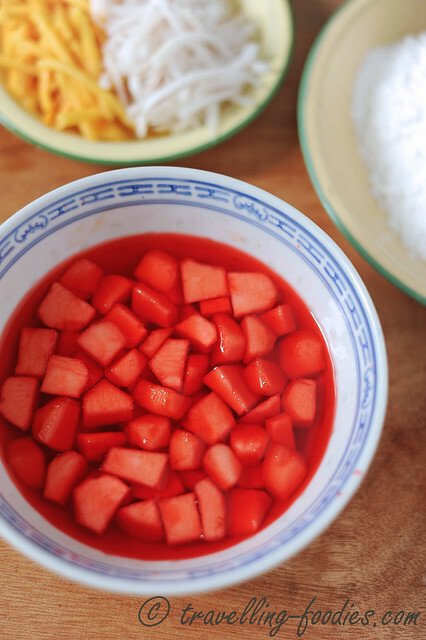 It is basically peeled chunks of water chestnut coloured red and robed with tapioca starch before being cooked and then dumped into a sweet coconut milk broth. That simple! I remember eating a version before which included sliced jackfruit and young coconut pulp, and I loved it! That’s why the version I make would always include these two “additional ingredients” despite not being found in the traditional Tub Tim Grob. After a good 15-20 minutes of soaking, the water chestnuts are then transferred onto a bed of tapioca starch. Sweet potato starch, sago flour or even arrowroot starch would do as well to produce that transparent effect with chewy textures but for most, the latter suggested flours are even harder to find. So try to stick to tapioca starch yeah? After robing the red chunks of water chestnut with a good coating of tapioca starch, they are not ready to be dumped into a pot of boiling water. Yes the water has to be a rolling boil with all the turbulent bubbling going on before introducing the water chestnut bits. This allows the chestnuts to be cooked more evenly, preventing them from sticking together during the cooking process. The chestnut chunks are ready when they begin to float on the water surface, afterwhich I would give them a good minute or two for the tapioca starch to thoroughly cook through. When properly done, there should not be any residual bits of white flour bits on the coating. If there is, simply let the water chestnut cook for a while longer.The water chestnut bits are then added into cold water for them to chill. Keep them in water until the dessert is ready to be served. 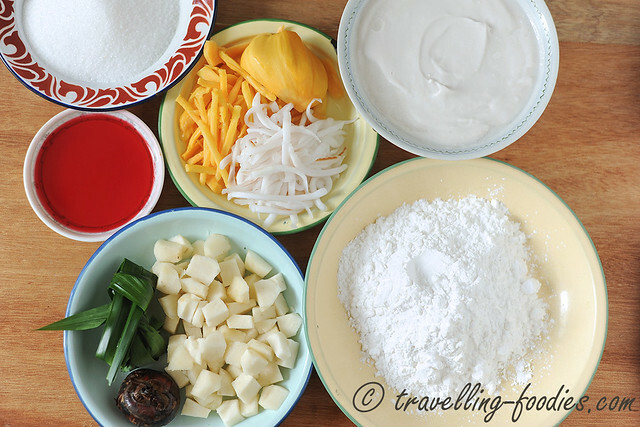 After that, all that needs to be done is to add the chunks of cooked water chestnut into the prepared sweet coconut milk broth, which is essentially just fresh coconut milk added with sufficient sugar and heated gently over a stove to melt the sugar. Do add a pinch of salt to accentuate the sweetness. Chill the coconut milk before hand and just add it into a bowl with the water chestnut chunks and Tub Tim Grob is ready to be served! First prepare the sweet coconut milk broth by adding coconut milk, pandan leaves, sugar and salt into a saucepan. Heat to melt the sugar and salt but do not allow the coconut milk to come to a boil as it would cause the fat in the milk to split. Set aside to cool down to room temperature before putting into the fridge to chill. While the sweet coconut milk broth is chilling, prepare the water chestnut bits. Soak the water chestnut in red food colouring and some water for 15-20 min until they are thoroughly soaked. 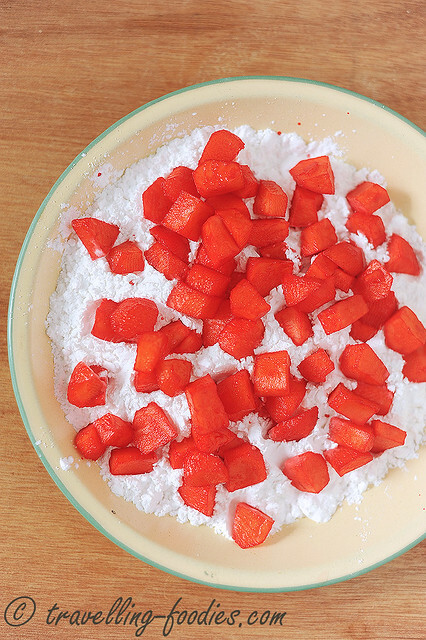 Robe the coloured water chestnut chunks by tossing them in a plate of tapioca starch. Make sure that each piece is individually coated generously with tapioca starch. Cook the water chestnut bits in a pot of boiling water until they turn transparent and begin to float onto the surface. Cook them for another 1 minute or so before removing from the boiling water with a sieve. Pour the “red rubies” i.e. cooked water chestnut chunks into a prepared bowl of cold water. 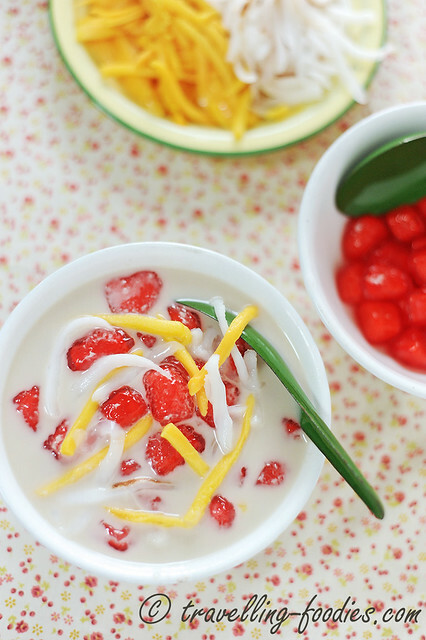 To assemble, place the “red rubies” into serving bowls and ladle enough chilled sweet coconut milk over them. Add shredded young coconut pulp and/or jackfruit before serving. This entry was posted on October 30, 2015 by Alan (travellingfoodies). 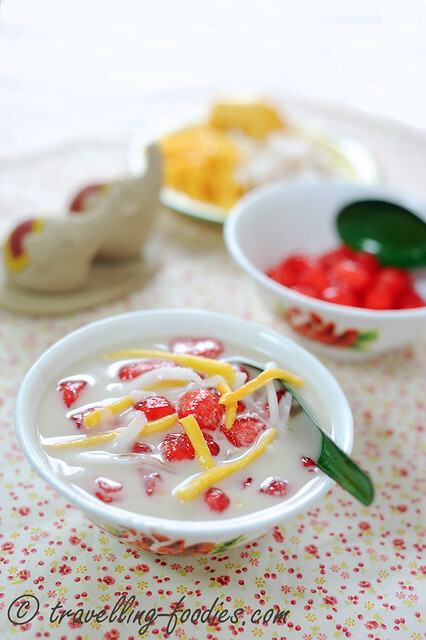 It was filed under Food, Simple Eats and was tagged with coconut milk, cold, dessert, jackfruit, red ruby, sweet, tapioca starch, thai dessert, thailand, Tub Tim Grob, water chestnut, young coconut pulp. Is it 500g of coconut milk or 500ml?